Swine Flu Vaccination - How safe is it? With the growing concern of Swine Flu, precautions are being taken to help stay less prone to contracting the disease. Swine flu (H1N1) is caused by Type A Influenza virus that spreads from contact to an infected individual. Early on in 1976, there was a vaccine introduced for the flu, but it later made headlines for having serious safety issues. Also, the previous outbreak in 2009 was far more widespread after which a new swine flu vaccine was introduced. This vaccine was believed to be fast tracked. The flu vaccination as per scientist claims was considered safe after the issue was rectified and any other flu vaccine ever since has not had any safety concerns. It is a fact however, that all flu vaccines will cause certain side effects such as rashes, itchiness, swelling, and redness. A small fraction of the population is also believed to experience symptoms like headache and low-grade fever post vaccination. Apart from this, people allergic to eggs cannot get vaccinated as eggs are used in the manufacture of the vaccine. Additionally, there are mild chances of Guillian Barre syndrome, a neurological disorder developing in one or two out of every ten or fifteen thousand individuals receiving the vaccine. This is difficult to detect solely through clinical trials and is a chance one might have to take for the greater benefit. To this scientists respond that Swine flu is similar to most other types of seasonal flu and hence the vaccine is at least 75% similar to the vaccines designed for other flu outbreaks that have occurred in the past. However, the vaccine does not protect against pandemic flu. None of the other flu vaccines have had any safety-associated problems. Hence, it is safe to assume that the swine flu vaccine is also safe. Another important concern is the use of thimerosal as part of the swine flu vaccination. Thimerosal is known to cause serious side effects when it was used in previous vaccines. 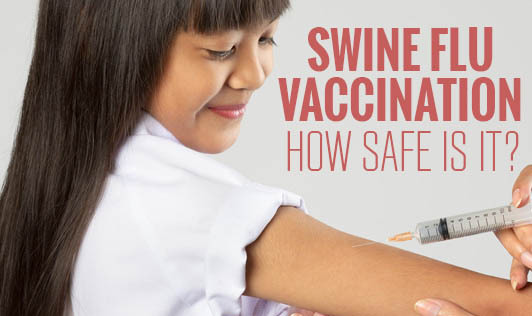 However, out of the nasal spray, single shots, and multi-shot vial forms of the vaccinations available for swine flu, only the multi-shot vials contain thimerosal that can prevent potential bacterial contamination of the vials. The use of thimerosal has been proven to be safe in the current H1N1 vaccinations. Nevertheless, the choice to get a single syringe shot is available anyway, but the access may be difficult depending on the location. With increasing number of deaths being attributed to Swine Flu, we may have no option but to bear with the symptom manifestation likely to occur post-vaccination, because the benefit that the vaccination offers far outweighs the few and rare vaccination risks.